All varieties of Euonymus Fortunei are evergreen and hold their colour particularly well in winter. Height and spread does depend on the variety from 1m / 3ft for "Emerald n Gold" up to 2.5m / 8ft for "Silver Queen". They are easily pruned to the height and shape you require with only a pair of secateurs and 10 minutes required. Any flowers produced are not noticeable, you are growing these shrubs for their foliage interest. Unlike some other evergreen plants, Euonymus loose none of their vibrant colour in winter. Height and spread varies by variety, anywhere between 60cm / 2ft to 2.5m / 8ft. It is fully hardy in almost all areas of the UK withstanding temperatures down to -12°C. Once established, it very rarely requires watering and will tolerate drought. It is maintenance free requiring only simple pruning to keep it to shape every couple of years. They make ideal plants for containers. The plant needs some air circulation so although it will thrive against a wall or fence, avoid planting it in the corner of two walls fences. It can be planted all year long if the soil is not frozen. Mid March to April and mid September to October are the best times to plant this shrub. When established a Euonymus Fortunei will look after itself. It almost never needs watering except in severe drought and will grow quite happily on average ground without the need of additional feeds. When you first plant a new Euonymus Fortunei make sure it has sufficient water for at least the first year of its life by which time the root system will have established itself well. Six months or so after planting, normally April time, prune the top third of the shrub away. No other complicated methods, just take a pair of shears / secateurs and cut away. This will encourage new growth from the base of the plant which will make it bush out. After that your Euonymus will look after itself. If you want to restrict its size, prune to shape in April or May time. We suggest that you take a look at the colour of the foliage every year or so to identify any which has lost its variegated markings. 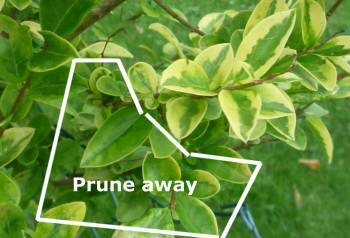 Prune the affected foliage away to retain the variegated areas. All the varieties share the ability to grow well in almost all conditions including dry, shade. They do however differ in colour and size as the following paragraphs show. These plants are available in varying stages of development from almost all garden centres and online plant suppliers. 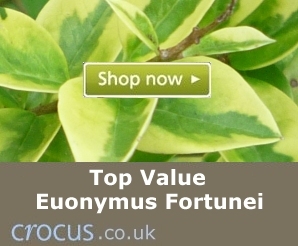 The online supplier we personally recommend for Euonymus Fortunei is Crocus. When buying Euonymus Fortunei varieties it's just as well to bear in mind that they grow relatively slowly, no more than 10cm / 4in per year and sometimes slower. This often explains the significant difference in price between young and older plants. Emerald Gaiety has an Award of Garden Merit from the RHS and quite rightly it is one of the most popular varieties. The leaves are bright green with white edges. Young leaves take on a lightly pink hue in winter. Reaching a maximum height of 1.2m / 4ft and a spread of 1.5m / 5ft, they are easily kept to shape with an annual prune. Emerald Gaiety makes an ideal hedge of up to 3ft / 1m high, easy to keep in shape, virtually maintenance free and has year round colour. An excellent choice if you want an evergreen plant for container growing. Another Euonymus Fortunei with a well deserved RHS Award of Garden Merit. In all respects it's the same as Emerald Gaiety (described above) however the leaves have a golden margin rather than a white margin. Silver Queen grows slightly taller than the two varieties above, to an ultimate height of 2m / 6ft and spread of 1.5m / 5ft. The leaves are variegated with a green centre portion and a white / yellow margin. A good choice for a slow growing, low maintenance hedge or a single plant on its own. Not recommended for container growing. A low growing variety reaching a maximum height and width of about 80cm. It's not small enough to be a rockery plant but it is good for under-planting between taller plants. The distinguishing feature is the foliage which is almost pure white when it emerges, turning to a very bright green and silver as the leaves age. Whilst 'Harlequin' are as strong and tolerant as the other varieties mentioned above, their foliage can suffer slightly if grown in full sun. On the other hand, the variegated foliage can be slightly bland if grown in shade. The best conditions seem to be full sun in the morning or the afternoon but avoiding full sun around the the middle of the day. 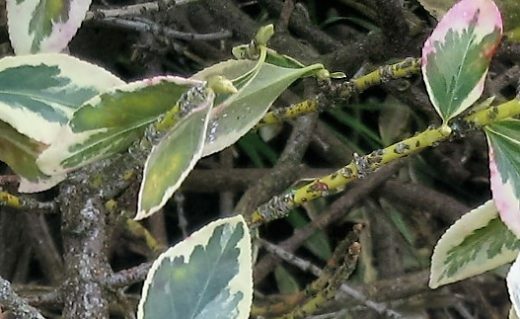 The most frequently encountered problem with Euonymus Fortunei is Powdery Mildew, even so it is not a common problem. The symptoms are a fine, white, powder-like coating on newly emerging leaves. This disease affects new leaves far more than older leaves. 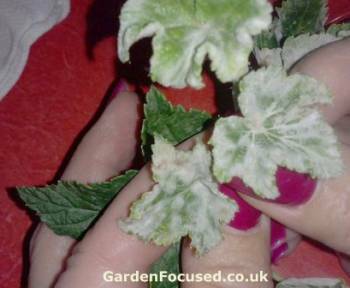 The picture below shows Powdery Mildew on a blackcurrant leaf but the symptoms are same for all leaves. We have a page written specifically about Powdery Mildew which describes the treatments available, both organic and chemical. Click here to go there now. Recognising an attack of Euonymus Scale depends on the time of year. From May to September the most visible sign will be the grey / white male insects on the surface of the leaves. Primarily on the undersides of the leaves they can also appear on the top surface. At certain times of year tiny crawlers will also be visible. See the picture below. At all times of the year you will also see the female scale insects. These will appear as brown / black scales on the stems. They don't move and have a protective outer coating. See the picture below. Courtesy of reader Tamara S.
Plants attacked by Euonymus Scale will generally grow poorly and leaves on the inner stems and lower down the plant will fall off. Euonymus Scale is native to East Asia and first appeared in the UK in 1936. It then disappeared and made a re-appearance in 1952. Over the last decade it has spread throughout England and Wales and is becoming far more common. In parts of the USA where this pest is better established the most commonly given advice is to dig up affected plants, burn them and replant resistant plants. 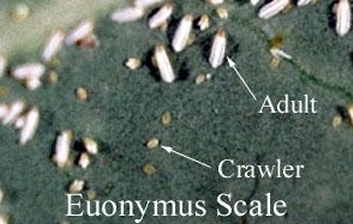 The life cycle of Euonymus Scale is described below. There are two generations each year, occasionally three. The first generation appears in May time when the females, which have overwintered on the stems, lay eggs. These become "crawlers" which feed for the next couple of days before choosing a permanent feeding place (males on leaves, females on stems) where they latch on and produce a waxy coating. During the year the males mate with the females to produce more eggs. Finally in September / October the males tend to die off but the fertilised females hide under their covering during winter. Pesticides are only effective when the scales are at the crawler or adult phase. The waxy coating which covers them at other stages of their life is impervious to pesticides. The problem is that that the two or three generations which occur each year tend to overlap. This effectively means that crawlers and adults are hatching from May to September time. The best sprays are Provado Ultimate Bug Killer or Bug Ultra Clear. The best itme to spray is when the crawlers and insects are active. Probably the most effective time is in early to mid May or as soon as you see the crawlers in May time. Having explained the treatment above, our advice we would be to consider carefully if you want to spend nearly a fiver on a pesticide which is not guaranteed to cure the problem. Sometimes it is best to dig the plant up, burn it and buy a different type which will not be affected. If you have any other problems with Euonymus Fortunei plants then please use our contact form at the end of this page and we will do our best to help. Below we list the key strengths and weaknesses of this plant.